Bicycles are great. They make moving about much more efficient and fast than walking, without having to worry about fuel, tax, insurance, parking etc etc. But if you need to take some stuff with you it gets more difficult. Cargo bikes come in two basic types; ones where you put all the stuff behind you, and ones where you put all the stuff in front of you. Putting stuff in front of you seems better to me. You can keep an eye on it and it seems like a more efficient use of space. Putting the cargo behind you means extending the chain and keeping things clear of the space your feet need to pedal in. Since I mainly wanted this bike to carry my two daughters I really wanted them to be in front of me where we can talk more easily and they have a good view. Bikes with extended front ends are commonly called "Long Johns" and although they can seem more difficult to make at first, with the need for a steering linkage and an extra headtube, it really isn't that difficult to make one. I dont know if this is a new way to make a Long John I made it up as I went along and it removes the need to have much in the way of jigs etc. I have a lathe and a pillar drill so I made the most of them, but with a bit of imagination you could manage without and do this whole thing with just a hand drill, a hacksaw, a file and some patience. Even if you dont want to make a Long John I hope that you enjoy reading this instructable and it gives you some inspiration to do something else in the same way that I was inspired to write my instructables by reading other peoples'. If you do decide to build something then make sure you stay safe, be careful with tools and don't ride any kind of bike unless you know it is safe. If you are some kind of fanatic you may want to build the entire thing from scratch, but it is a lot of extra work when you can easily find a donor bike to give you all the "difficult bits" ready made. 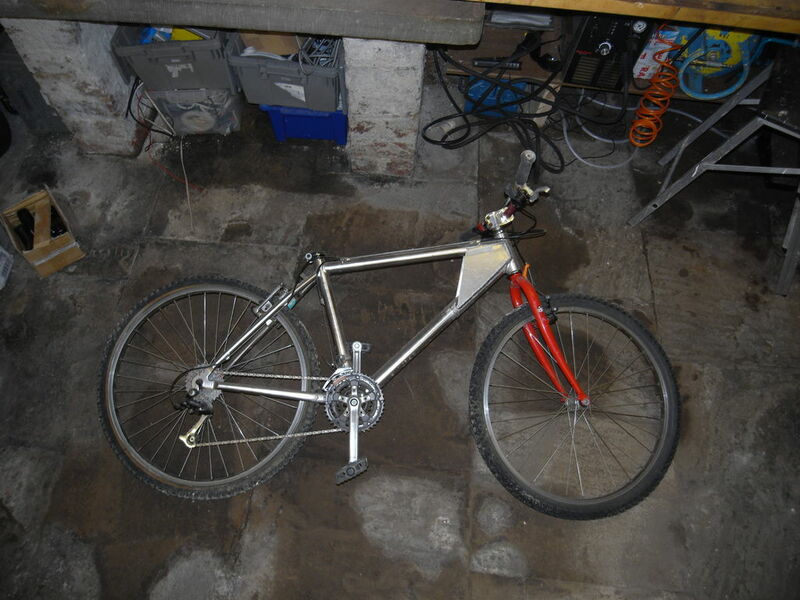 I didn't have to look far for a donor bike as I had this old mountain bike cluttering up the cellar. This is/was actually my wife's bike, but she hasnt ridden it in years and really deserves a new bike. It had also had a pretty rough life so the front triangle wasnt up to much anyway, so it was perfect for this project. It forced me to build in Aluminium which was fine by me because I wanted to keep the weight under control and it is easy to work with (aside from the welding). This frame is 7005 aluminium which means you need slightly different welding rods, but this isnt a huge hassle. It is important to bear in mind that welding an aluminium frame will mess up the temper of the aluminium, but some of this strength will be regained with age hardening over time and we are going to be fairly heavily over engineering this thing anyway. Once you have decided on your donor bike you need to design around it. I had decided to switch from a 26" to a 24" back wheel to help get lower gears for the hills round here. I am never going to go much above 15mph on this so there really isnt much need for high gears but believe me the low gear is essential if you have any kind of hills to contend with. My gears ended up being about 29", 39" and 52" using a Shimano Nexus three speed hub with a roller brake which also solved any kind of braking issues. I also opted to have a good low BB so that it would be easy to put a foot down to stabilise when stopping. For a front wheel I went with a 20" wheel because I had plenty of them spare and plenty of good strong forks to go with it. But more importantly a small front wheel helps keep the cargo space big without the wheelbase getting too big which is a pain for manouvering in tight spaces. My design was chosen to be simple and easy to make. I also wanted to leave the design open to adaption later as my children grow. When they outgrow the box I can convert this into a "Child in-front Tandem". By using a single rectangular tube all the way from the bottom bracket to the front headtube everything would be fairly "self jigging" and solid. I think the main tube is 50mm wide 100mm high and 3mm wall thickness and 6082 grade which isnt spectacularly good stuff, but cheap, weldable and easy to find. If you dont have thousands of dollars wort... sorry cost of Solidworks, a pencil and paper will work just fine too, it is just a bit harder to tweak it about until you like it. The central circle is where the kinkstand will swing if I ever get round to making it. The aim of the kickstand is to allow the children to climb in and out on their own while keeping the wheels on the ground so it doesnt tip around the stand. Ha. What a hypocrite. In this instance I did tidy up and clear the bench but that soon went out the window. Most of the time this place is a tip but a clear working space is a great help if you can be bothered. Pretty self explanatory. Nice sharp hacksaw blade and a few minutes work to remove what you dont want. If you dont have a lathe to make new headtubes, and dont want to buy new headtubes to use, then you may want to cut the headtube off the donor frame too. My donor bikes headtube was done and I wanted to use modern integrated headsets because they are so simple to work with. I had bought a length of aluminium box to be the main structural member of the frame which would slip over the stub of downtube left on the BB shell which would help locate things for welding, but the old welds were in the way so time to get busy with the hand file. A good sharp file costs very little and is an incredibly versatile tool. No need to resort to a noisy angle grinder. It is important to try to avoid damaging the threads in the BB shell, so I clamped the frame between two off-cuts of Oak. Dont stress though if you do do some slight damage as we are going to have to chase the threads out after welding anyway. My plan for this design is to be self jigging, so all the joints are made by drilling holes straight through the tube in carefully worked out locations, any slight deviation from perpendicular can be fixed with a bit of hand filing. A good tip for getting a square mark all around a tube (whether the tube is round or square or shaped like a rabbit) is to wrap a piece of paper with a straight side around the tube; then wiggle it to get the ends to meet up. As long as the tube is not tapered the resulting line will be perpendicular to the axis of the tube. If you want the holes for say the headtube to be off perpendicular then you can just measure away from this line the correct amount. So to get a headtube at 88 degrees to the main tube you mark one side, then wrap the paper and mark 3.5mm off to get that 2 degree deviation (100 tan 2). Then just drill through both marks straight. A little filing will get it all working. Measure down to your bench and prop things up to check BB height especially. You can manage with a headtube angle that is off by a degree or so, but if your BB ends up too high or too low it will be really annoying and a small angular error over this length can easily add up to pedals hitting the ground or something equally annoying. I left the top tube in place until this step to help me get the new main tube lined up with the back end. By looking down I could check everything was in line. But now it is time to whip off the top tube too. To avoid damaging anything whilst filing I chose to clamp the frame to an old stub of seatpost and then clamp that in the vice. The big aluminium beam is fine with the kind of loads we are likely to put into it, but the donor frame was never designed to have a big bending moment imposed at the base of the very thin seat tube so I wanted to put a brace in. I didnt want to make the brace super beefy so it was going to come in directly on a flange of the box and clear of the sidewalls, so to prevent this wall buckling in I added an extra plate here. Because the thin space between the reinforcement plate and the main beam needs to breathe during welding I put a hole through the middle. I used the lathe to mitre the top end of the tube in the sketchy way shown below. Sorry didnt get photos of this but its very straight forward, Cutting and welding on plates to mount the box to. Those are some nice welds right? Shame I cant take credit for them. I do have a TIG welder that could do it, but I also have an awesome family of welders in my city who have been helping me out for years. JNC welding in Sheffield. They weld everything from copper to titanium and surgical instruments to ice-cream moulds. Most big cities will have some jobbing welders who will help you out. Take them tea and biscuits and make friends. Pay cash and respect their experience and expertise and you will be set forever for all your welding needs. If the weld has good penetration (which you want) then chances are there will be bits of weld that will prevent your seat post going in and your BB cups threading in. In the before and after pics you can see weld in the seat tube. It just happens that I had a suitable size reamer so I cleared this out myself, but I didn't have taps for the BB shell so I took it to my local bike shop for that step. Most good bike shops will have both these tools and shouldn't charge you much to do the work. I made my own paint for this. Since it is all aluminium I wasnt too worried about corrosion, so I opted to experiment with some home-made linseed-oil paint which has the advantage of being very green and unlikely to be at all toxic which is a consideration when carrying children. Paint was just a mix of raw linseed oil and childrens powder paint (day-glo orange in this case). The oil needs to be warmed to help it mix and so that as it cools on the frame it will tend to be less likely to run. It turns out that this paint DOES work on aluminium but not nearly as well as it does on wood where it is far superior to modern alkalid paints as it lets the wood breathe. I also took the opportunity to weigh the frame. About 10lbs which isnt bad considering, though obviously you get the added weight of the steering linkage and extra steering column. Next up is the steering. Sorry I didnt document this that carefully but it is fairly simple. The steering column is just a 1,1/8" aluminium tube with a plate welded to the end. I use two top headset sections and two seat-clamps to locate this on the bearings so there is no need for any precise machining on here (this tube is too big to fit in my lathe). The seat clamp and top wedge arrangement also allows me to fine tune the position of the steerer a little. The link rod is just a tube with two turned bosses welded in the ends, and cable guides fitted. I didnt want to use a super long (tandem specific) brake cable and breaking the outer brake cable like this reduces flex and allows the use of two standard length cables joined with a little connector on this stretch. I also routed the front brake cable down through the steerer tube to eliminate another run of outer cable and for neatness. Two spherical rod ends screw into the ends of the link rod to cope with the offset steering axis etc. In hindsight a steeper steering column angle would have helped with this but might have made the seating position in the box a bit upright. The final part of the steering system is the fork peg. The neat way to do this is to fix it to the crown of the fork, but I was getting impatient by this stage and this is super quick and easy to do. The square "peg" bolts onto the end of the hub axle and has the spherical rod end bolt into one side. I decided to go with an internally geared hub and no derailleur even though this bike originally had vertical dropouts. The advantage of this is that you can get in a suitable gear before you set off if you forget to change down when stopping. With the girls in the front it is important to be able to ride smoothly and this is helpful. Because of this I had to work out the ratios carefully and use suitable size sprockets, to avoid using a chain tensioner. In my case it turned out that 33:20 (from memory) was the right gear. I also wanted to run a nice fat single speed BMX chain instead of a narrow chain, so I wanted proper 1/8" thick sprockets. But the only cranks I had spare for a euro BB were these nasty things. But a bit of work on the lathe and pillar drill soon married an old 33 tooth BMX sprocket to the multispeed crankset spider. At this stage it is just bike assembly. The only notable things are that the fork needs another seatclamp to keep it together. This bike has four seat clamps and parts from three headsets. And the Shimano Nexus hub comes with a nasty grip-shift instead of a lovely thumb shifter (BOO!) so I needed to file the brake-lever to clear it. With it all assembled I did a quick weigh again and then took it for a spin. The weight at this stage is 17.4 kgs which is about 38lbs, and this showed when riding it in this state. With no box on it rode beautifully and felt nice and stable at speed thanks to the shear length of the wheelbase. Steering takes virtually no time to get used to. The only weird thing is that you need to steer MORE than normal, ie. when you might normally steer through 10 degrees you need to steer through 15 or 20 with this to make up for the long wheelbase. This could be accounted for by making the peg on the fork shorter than the arm on the steering column, but I had little tyre clearance/steering angle available anyway so I didnt want to reduce it further. After a lot of thought I went with basic plywood and aluminium angle to make the box. This is not a great solution because the wood is so inefficiently used and therefore heavy. If I had more time and the inclination then the ideal solution would be to make a double skin fibreglass box with a honeycomb core. This would save several pounds off the weight which would be very welcome. One sheet of ply was notched to hang over the main beam and form a back, and one sheet was nothced and slid up under the main beam at the front to screw to the front plate. Then it was just a case of linking all the sides and floor with angle. Because none of the angles were 90degrees I had to open out each piece of angle by squashing the corner between a round steel bar and the vice jaw. Hopefully the pictures are fairly self explanatory. Main corner pieces were screwed on and then corner additions pop-riveted through those to solidify the corners. These views also give you a good look at some of the steering linkage parts. One thing to note is that I brought the bike up from the cellar to build the box as I wasnt sure it would fit up the stairs with it fitted. 2. Bikes for more than one person rule. 3. If you want a cargo bike but don't want to pay thousands for a Dutch tank made of Hi-Ten steel think about building your own. 4. This bike is now close to 50lbs. My daughters now (a year on) weigh about 40lbs each. Yet picking them up from nursery and riding back up a steep hill is an absolute pleasure. They love it and I love it. Although it is obviously damn hard work going up a 1 in 5 with a 300lb gross weight vehicle the gears arguably make it easier than pushing them in a pram. 5. You could always add an electric assist. 6. If you build one, think long and hard about the handlebar height/clearance and the brakes. This really needs a front disc for the hills where I live. I think that's it. If I missed anything ask me in the comments. Excellent project. I look at the photo and see a man i remeber teaching me to build wheels in ride uk many moons ago! Together with sheldon brown you've taught me a lot glad to see you are still involved with bikes! Really love this design, but welding Aluminum is not something I have much experience with, so I'm keeping to the steel tubing. I like your thought process in allowing for conversion to the 2 or 3 model later on when the kids are grown up. Very nice of you to say so, thanks. Quite thrilling for the little passengers and good for the grocery store too. Now just have to keep haveing kids till the bike is wore out ! Nicely done. Almost a mirror image of mine. The exact same idea in every way, only mine is made of cromoly steel. I was thinking that if you made the box more structural (adding a frame around the top edges) then you could use the box as the structural link from the pedal end to the front wheel. The big advantage would be that you could put larger things/people that would not fit with the box divided. I spent quite a while considering this option. It's a good idea, the only issue is with torsion. Any kind of structure that can cope with the torsional loads ends up being a real pain to make, though it does mean that the "box" can become a hammock like structure which would save a LOT of weight. Very good - is your workshop in a cellar - it looks cool (in more than one way)? Yes the workshop is almost completely below ground level so the temperature is fairly cool but steady all year round. Probably about 10 degrees C. Usually I am fairly active down there so the cold isn't an issue. I run dehumidifiers to keep the damp under control. Oh yea, if you're busy you don't get cold, but I like subterranean. Great tutorial. I wish this had been around a few years ago. My husband started from scratch on making bakfiets. We now have finished 6. some used for cargo (hay bales to concrete), others for kids and groceries and one really large one to transport a full stage for a local theater company. I have been very slack in getting it up, did most of the work over a year ago now. Yours look lovely. I cant see myself making any more for a while, storing this one is a bit of an issue with no garage and I have 5 or 6 other bikes stashed about the place.